It’s only 19 miles from Brook Park to Avon Lake near Cleveland in northeast Ohio, but it’s a world away from where Dennis Daniels started his aluminum foundry. All Daniels wanted to do was cast aluminum parts, so in 1972 he set up shop in a small garage in Brook Park. He was the only employee. Secondary machining was never part of the plan. High-quality parts, on-time delivery and the best pricing matter most to the company’s customers. Today, Daniels leads a company with 104 employees working in an 110,000-square-foot foundry and machine shop in Avon Lake, supplying aluminum die-cast parts and finished subassemblies to global manufacturers of heavy trucks, autos and industrial equipment. Secondary machining of those parts generates 40 percent of Alumalloy Metalcasting Co.’s revenue. That’s not the business Daniels expected to build, but it’s how he chose to keep Alumalloy competitive in a fast-changing market. High-quality parts, on-time delivery and the best pricing matter most to the company’s customers. 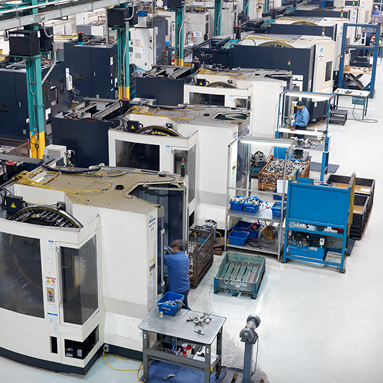 To win and keep their orders, Daniels and his team depend on 10 Makino horizontal machining centers, beginning with the first a81 mill he purchased in 2007. The machines enable Alumalloy to produce repeatable tolerances as tight as 15 microns on some parts and to consistently meet deadlines in a demanding production environment. Nothing in Daniels background prepared him to set up a machine shop let alone turn machining into what powers Alumalloy’s growth today. He had worked for five years as a supervisor at a now-defunct aluminum sand casting company in Avon Lake. He quit that job to start his own business focused on a different approach to making aluminum parts called permanent mold casting. As Alumalloy grew, Daniels moved his foundry from that garage in Brook Park to a larger facility in the old industrial area of Cleveland known as The Flats. 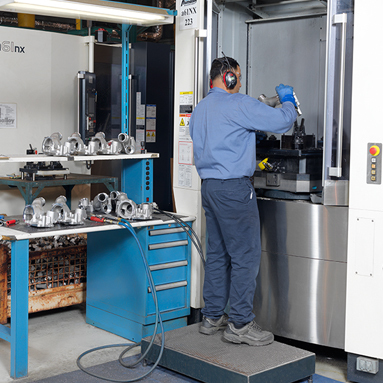 When a customer needed secondary machining, Alumalloy hired third-party machine shops to complete the parts. Too often, quality issues would be blamed on casting when in fact they occurred in the secondary operations. The third-party machine shops also frequently would push back deadlines, forcing Alumalloy to extend its lead-times. 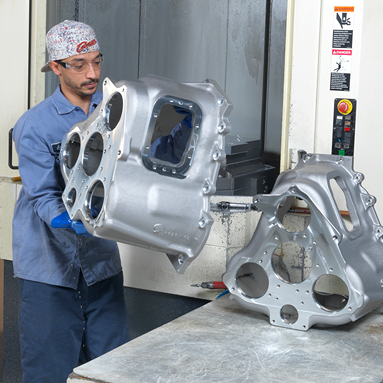 To best serve his customers, Daniels decided Alumalloy would machine its own parts, handling all aspect of the die-cast part production in-house. In 1989, Daniels purchased a used vertical machining center with fixtures. At that time, few foundries owned CNC mills or employed machinists. Alumalloy was an early adopter, and as a result the company’s employees had to learn machining on the job. Daniels and his team sought advice from tool distributors and taught themselves how to operate their commodity mill. Daniels sent Cole, then one of his second-shift bandsaw operators, to machining classes at a local community college. Today, Cole, with two degrees in industrial engineering, oversees Alumalloy’s machine shop. Alumalloy continued to expand its secondary machining, eventually adding four commodity mills and a lathe. The company struggled with extended lead-times, however, because of reliability issues, including poor chip removal and frequent way-cover replacements on the older machining centers. By 2006, while preparing to bid on a large job, Daniels decided to attend the International Manufacturing Technology Show (IMTS). 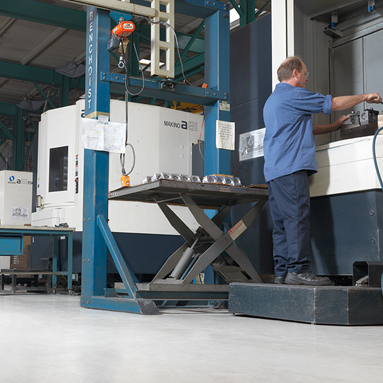 He wanted to find horizontal machining centers to expand capacity to fulfill the new contract—and that would improve his company’s reliability and productivity. That trade show visit prepared Daniels to select the next path for his company. In 2007, Alumalloy purchased its first a81 630mm horizontal machining center. Since then, the company has added four more a81 machines and five a61nx 500mm horizontal machining centers. Since investing in the a81 and a61nx machines, Alumalloy maintains the reliability needed to meet demand for annual production quantities of up to 50,000 parts per order. To accommodate what’s become a full-service machine shop, Alumalloy purchased buildings that once housed that aluminum foundry in Avon Lake where Daniels began his career. Alumalloy recently finished converting a sand casting area that had been abandoned 20 years ago. Now the company has its mills in two well-organized lines in a clean, up-to-date facility with floor space to add more horizontal machining centers. Air conditioning has been added to provide consistent temperatures needed to hold part tolerances. The company has not had to replace a way cover on the a81 and a61nx machines, eliminating what had been a constant problem with the commodity equipment Alumalloy previously used. Chip removal is no longer an issue and downtime is limited to machine maintenance. The central coolant flush system on the a81 and a61nx machines effectively evacuates chips for improved quality and reliability. “They’re simple machines, especially the way they handle chips. Other machine shops struggle with chips. We don’t,” Daniels said. The continuous-pressure hydraulic fixtures Daniels shopped for at IMTS are installed on three of the a81 machines. Alumalloy runs bigger parts in large quantities for truck transmissions on these machines, and continuous-pressure hydraulic fixtures reduce the time needed to load and unload parts while delivering repeatable part locating and consistent clamping force. 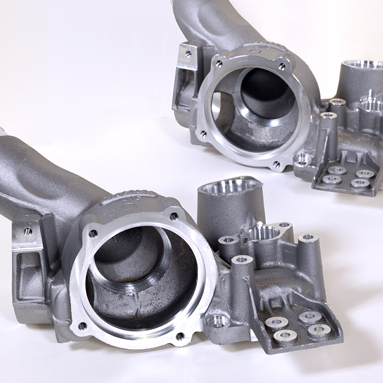 As a result, Alumalloy holds tolerances as tight as 15 microns on the heavy-truck transmission housings. With high-performance machining capabilities in-house, Alumalloy is also able to use secondary machining as a quality assurance process for its foundry. The company today identifies exactly when and where any true quality issues arise and moves quickly to resolve them before parts are shipped. 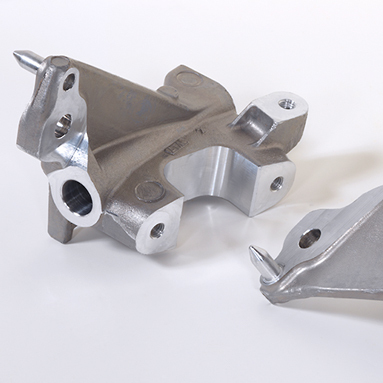 For a company originally centered on making aluminum die-cast parts with one casting method, the makeover is remarkable. Alumalloy today offers a complete casting and secondary machining operation ensuring consistent high quality and on-time delivery. Alumalloy’s customers seek this start-to-finish capability across a wide range of part types and sizes. For Volvo, Alumalloy makes various engine and transmission parts and completes some subassemblies for its customers’ Volvo and Mack trucks. For General Motors, Alumalloy makes safety-critical suspension sway bars, along with windshield corner brackets for the Chevrolet Corvette. “We can offer the customer a full part that they can put on their vehicle. Without that, we’d be a fourth the size we are today,” Daniels said. Daniels and company control the quality of every part, from the pouring of castings to secondary machining to subassembly as needed. The capabilities Alumalloy offers from raw materials to finished parts set the company apart from competitors offering only foundry or just machining services. Alumalloy has even won back 18 parts orders that had gone to competitors in China. “Some of the customers we get now will only entertain a bid because we can do everything under one roof,” Daniels said. 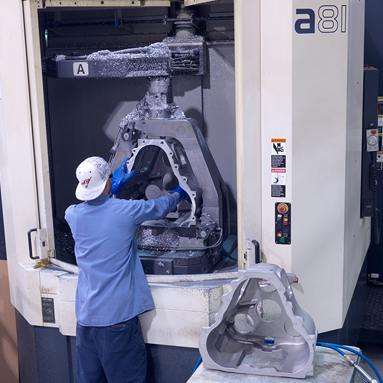 To deliver “everything,” Alumalloy runs one extended shift and depends on the reliable performance of the a81 and a61nx horizontal machining centers. Alumalloy has more than 100 part numbers with short runs, so the mills must be continually available. With high-performance machining capabilities in-house, Alumalloy now has full process control to ensure the highest degree of part quality for their customers. 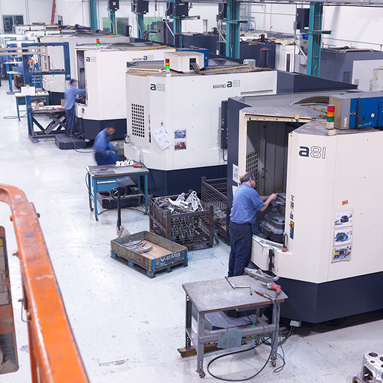 The reliability of the a81 and a61nx machines has enabled Alumalloy to meet demand for annual production quantities of up to 50,000 parts per order. Alumalloy’s customers appreciate the company’s start-to-finish production capability across a wide range of part types and sizes. 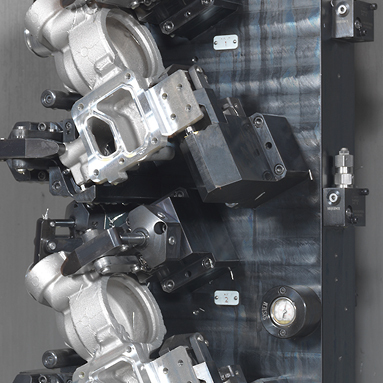 Continuous-pressure hydraulic fixtures reduce the time needed to load and unload parts while delivering repeatable part locating and consistent clamping force. With the Makino machines, Alumalloy is able to produce repeatable tolerances as tight as 15 microns in heavy-truck transmission housings, and consistently meet deadlines in a demanding production environment. By adding high-performance secondary machining operations to its capabilities, Alumalloy has even won back 18 parts orders that had previously gone to competitors in China. 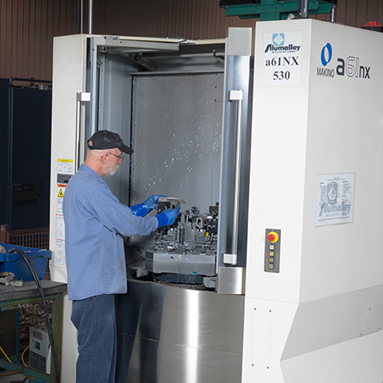 Since 2007, Alumalloy has expanded its secondary machining services through investments in 10 Makino horizontal machining centers.